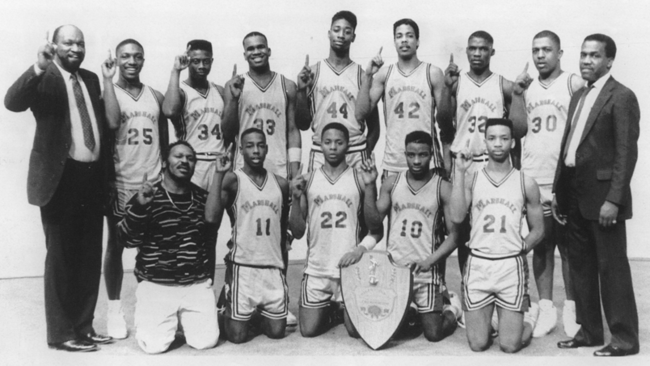 The familiarity and sadness of certain scenes (William Gates missing a crucial foul shot, Arthur Agee’s parents paying a humiliating visit to St. Joseph’s, a suburban Chicago prep school, where they must bow and scrape and beg for a transcript of their son’s grades) almost broke my heart the first time I watched Hoop Dreams. You might think I’m exaggerating my reaction, and I admit I’ve played hoop from grade school through college, then internationally, semipro, and, until just yesterday, on playgrounds across the U.S. of A. So, yes, I might be a sucker for Hoop Dreams. But Hoop Dreams evoked more than basketball fantasies and frustrations. It reminded me of the scariness, the loneliness, the utter devastation of being a fifteen year old with the world on a string and suddenly, somehow, the string gets snipped. The bottom falls out, you with it. Serious players experience the power of desire, how high desire elevates the body, how low you go if desire is defeated. To lose an important game, or worse, be the one who clunks a shot that could have won it, teaches a player the heartbreaking reality of the games people play, how unforgiving, implacable, and unforgettable they can be, how some vast reservoir of emotion located inside the chest—since naming things is claiming things, why not call the emotion heart—ices over and begins to crack in a split-second, when with overwhelming clarity and certainty, a wish, a possibility nurtured perhaps for as long as you can remember, gets snatched away. Hoop Dreams’ subject is heart, the heart’s seriousness that is play, its play that is seriousness. A player learns from basketball the same lessons taught by interactions with family, friends, lovers: what heart is, how much heart strength it requires to impose your will during difficult circumstances, the fragility at the heart’s core when failure to achieve a goal must be confronted. At its best, Hoop Dreams, in the manner of African-American folklore, works through indirection and signifying, transforming mundane, concrete details of everyday life into haunting, daunting metaphor. Hoop Dreams doesn’t appropriate, exploit, or pretend to explain the complex inner reality of the two young men whose lives it follows over the course of five years. By doggedly, expansively, scrupulously recording the outer reality of images and voices surrounding them, the documentary authenticates the secret heartplace taking shape inside its protagonists. Viewers are positioned less to judge this private process than to identify with its excitement and pain. Watching Hoop Dreams again, more than a decade after it originally appeared, hurts in another way. Why have so few films followed its lead—its patience, dedication, undogmatic, unpretentious point of view, its living with and through its characters’ daily lives, foregrounding these lives so they bear witness? Editing, mediation are inevitable when constructing a narrative drawn from hundreds of hours of tape. The final cut of Hoop Dreams, however, seems not based on assumptions the filmmakers formed before they encountered the actual lives of their subjects but a story that evolved naturally as footage accumulated. A sense of gradual, dramatic revelation, of complicity in lives unpredictably unfolding, is achieved, in spite not because of the camera’s intervention. Why so much trash about African-American lives on TV and in the movies since Hoop Dreams (do I need to name names or point fingers? ); why all the superficial, commercialized packaging, hype, and exploitation just at a point in time when the will and means—technically, financially, politically—to tell different stories, to dream different stories, had become a bit more accessible for blacks and whites? I was surprised viewing Hoop Dreams this time around by the adroitness with which the film keeps basketball present and absent simultaneously. Hoop Dreams would be impossible without hoop. Just as War and Peace would be impossible without war. But Hoop Dreams is not about hoop. The hoop dream of the film’s title is identified quickly, efficiently, as the dream of playing professional basketball shared by William Gates and Arthur Agee, fourteen-year-old kids we see in their homes watching an NBA all-star game on TV, a game featuring their idol Isiah Thomas, a Chicago boy just like them, born black, poor, and crazy about hoops. NBA stardom, with its fabulous riches, fame, and status, possesses a double allure for poor kids: its glorious way of getting paid and paying back—Mom, especially, for her sacrifices but also the doubters for their doubts. All boats rise on the NBA tide. Hoop Dreams conveys the particular seductiveness and resonance of this dream for two talented Chicago teenagers, but the documentary also stocks bigger game; it studies what happens in the lived space between any reality and any dream, examining the minute-by-minute choices, trials, the step-by-step grind or dance or crawl or flight over burning coals that constitutes anybody’s journey toward a dream’s ever-receding, mythical shore. You know, like Europeans crossing the Atlantic for new lives, or African slaves struggling for freedom, or the fight to dismantle apartheid, or the battle for gender equality, or building word-by-word, brick-by-brick, something worthwhile you can be proud of. The specific dream of pro-ball exerts its presence in Hoop Dreams as language, rhythm, as images of its deities decorating posters and clothes, an aesthetic, an ethos, a plotline, narrative line, as often in the margins or offstage as center stage, while we witness five eventful years of two boys’ lives compressed into three hours of screen time. The film is consistently not an exposition or analysis of basketball’s rules, techniques, theories, economics, styles, history, etc. ; it’s not an NBA groupie or a detached critic. The camera participates in the everyday action of two kids growing up, visualizes their encounters with the abstract, socializing structures—family, school, work, play—that relentlessly shape all of us. In this case, the case of Agee and Gates, the film exposes a network of deeply rooted prejudice, hypocrisy, and lies that makes coming of age in an economically deprived urban environment a kind of inherited incarceration with very few means of escape. With pluck and luck, Gates and Agee gingerly avoid pitfalls, only to slam into solid, unmovable walls. After previewing Hoop Dreams more than a decade ago, I declined an invitation to collaborate on a book version of the film, because I believed a book would be redundant given the film’s cinematic power. But every chance I got, I pitched the documentary to my friends as a movie not to be missed, one of the most insightful, accurate, affecting, least sentimental, least propagandized treatments of Afro-American family life I’d ever seen. I still say that. Growing up, I needed basketball because my family was poor and colored, hemmed in by material circumstances none of us controlled. If I wanted more than poverty and exclusion, I had to find a way to single myself out. The if was a real question, a stumbling block most kids in my community couldn’t get past. Sure. The truth is everybody wants more. But how strong is the desire? What productive energy does the desire create? How many young people really are convinced they deserve more or believe they possess the talent to achieve more? The idea of race and the structure of racism in our country conspire against Afro-American kids believing in themselves. The strident, over-the-top self-assertion and violence of much popular music attest to a kind of pumped-up, fantasy overcompensation for this crippling disbelief. To resist the negative prospects impressed continuously upon a black kid’s consciousness, that kid, like any of us, must first believe she or he deserves more, then imagine what more might be. Risk entering the space between known and unknown, risk opening a door to alternative possibilities. Whatever the dream—playing basketball, writing, going to college—it can serve as a means of learning about oneself, teaching oneself to seek internal qualities worth saving. Cultivating abilities others might appreciate, praise, and reward, yes, but above all, proving to oneself that worthwhile qualities exist. The goal of becoming a great basketball player guarantees nothing. No dream does. What counts is making plans, confronting challenges, experiencing the action. Process, not product. Learning to play with desire, seriousness, and determination, playing for rewards that reside inside the heart not outside it, playing not only for material benefits that come and go like weather, like seasons, but for “intangibles” that last. Hoop Dreams raises the eternal question, eternal because unanswerable, because the beat goes on. Who am I? Am I worth the trouble, worth a good hot damn? Will I embarrass myself? Fail? Or will I represent? Play. Shine forth. John Edgar Wideman: fiction writer–essayist–former hoopster–Asa Messer Professor of Africana Studies and English at Brown University. Latest book: God’s Gym (Houghton Mifflin).